Rates include all rods and reels, tackle, gasoline, parking fees , boating necessities (adult life jackets, etc) and Bait (we catch our bait daily from the lake). Gratuities are appreciated. Small children should bring their own life jackets. All you need to bring are clothes appropriate for the day (warm clothes, rain gear, suntan lotion, etc.) and your food and drinks. Fishing June through August can be fast and furious, it is not uncommon to catch 50 to 100 fish a morning. Our best day in 2014 we caught 275 Stripers on May 28th. Due to intense action we highly recommend at least 4 anglers being on the boat in the months of June through August to handle the action. After fishing the lake for over 30 years and having little to no success catching Stripers mid day we are only offering 1/2 and 3/4 day charters. Once boat traffic gets up and the Sun gets high in the sky Stripers simply turn off and quit feeding. We will still continue to do morning and evening charters. You will also need a Virginia Freshwater fishing license, which can be purchased online at http://secure01.virginiainteractive.org/horf/ or in person at High Point Marina. All departing and return times will be determined by your Captain and differ seasonally. Check with him prior to arrival. Generally a trip will consist of an 8 hour day, but again the time you spend on the water differs with the seasons. In the cooler months we usually stay on the water for 8 hours or so. In the warmer months when the water temperature reaches the 80's we may come off the water once we have caught our legal limits (see Catch and Release below). Of course you are welcome to get out early and come catch bait with us. The Virginia Department of Inland Game and Fisheries manage the stockings of Striper fingerlings in Lake Anna and generally stock about 250,000 fingerlings a year. In 2007 they increased their stockings to over 300,000. In a sense, the lake is an artificial fishery in so much as the Striper Spawn is not successful here and the VDIGF can regulate the numbers of keeper Stripers that roam the lake depending on such factors as fingerling success ratios, prolonged adverse weather conditions, baitfish availability to the Stripers, fishing presure, etc. 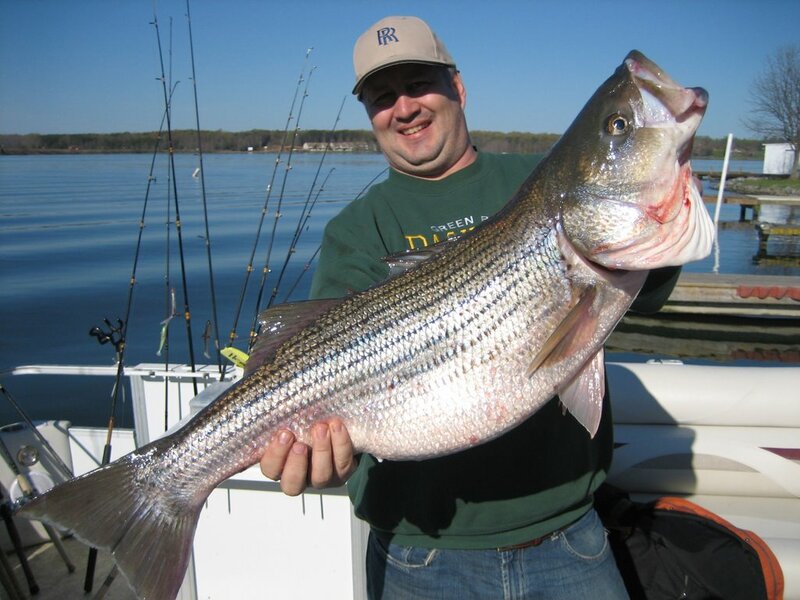 VDGIF has imposed a liberal creel limit of 4 Stripers per person per day over 20 inches . Catch and Release has worked to increase Largemouth Bass populations whereby Bass actually spawn in the lake but may or may not work well for the Striper, depending on the size of the released Striper, the condition the Striper was released in and primarily the Water Temperature. Studies have shown that the mortality rate of released Stripers increases dramatically with warmer water. Some figures suggest that the mortality rate for released Stripers are 50% at 81 degrees and jumps up to 67% at 88 degrees, compared to less than 5% mortality in cold water. Studies also indicate that mortality increased with the amount of bleeding that occurred, 9% Mortality for fish not bleeding or bleeding slightly, 33% for light bleeders and 75% for heavy bleeders. In order to be good Stewards of the lake when the water temperatures exceed 80* and our daily limits are caught your Captain may decide to come off the water early.